I have been perusing the net for some inspiration for both hair pieces and photo styling, I found these via Shibawi. 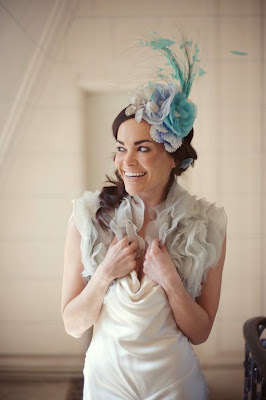 This is a fun fascinator and I think an even better photo, showcasing the head piece. I love that shrug too - or top of the dress?! Gorgeous. All but the blue head piece are from Johanna Johnson. Oh. Those. Are. Gorgeous. Honestly, I think I was born too late. Should have been around in the Great Gatsby era, I think, so I could wear outfits like those. Particularly like the last image. Very fancy! And those are definitely great styling examples.